I once read an interview with Roddy McDowell in which he stated that actors have three stages in their careers, and that they are not always successful in each. In the beginning you win them by simply being charming. You're young and beautiful, have an impish smile, whatever. Then you mature and the little gimmicks that charmed audiences don't quite cut it. In the last stage you are an elder statesman of the silver screen and the roles are of an entirely different class as you re-invent yourself once more. Morgan Freeman, Clint Eastwood and Michael Caine come to mind here... and Jack Nicholson. Nicholson is an actor who by any measure has had a charmed career in the film industry. And deservedly so when you remember the range of memorable characters he has invented since catching our attention as George Hanson in Peter Fonda's Easy Rider. Who can forget J.J. Gittes in Chinatown, or Randall P. McMurphy in One Flew Over the Cuckoo's Nest? It's the uniqueness of the characters he inhabits that is as surprising as anything. Compare the obsessive/compulsive writer Melvin Udall in As Good As It Gets to mob boss Frank Costello in The Departed. Both roles show range. And in About Schmidt we see another subtly fine performance, possibly less appreciated because it doesn't draw attention to itself. The film was a sleeper, perhaps because of the seriousness of its tone while simultaneously being marketed as a comedy. We missed it in the theaters, if it ever came to out neck of the woods, but saw it referenced in a book by Robert K. Johnston titled Useless Beauty. Johnston's book analyzes the complex engagement between faith and culture by studying a range of contemporary films including among others Signs, Magnolia, and Run, Lola, Run. The book's subtitle is Ecclesiastes through the Lens of Contemporary Film. About Schmidt begins with Nicholson as businessman Warren Schmidt sitting in his office at the Woodmen Insurance Company in Omaha, watching the second hand on the clock as it ticks out the last moments of his career there, boxes packed, time marching on. He is alone, and it's evident that this aloneness is a hallmark of his life. Retirement happens to him, but it is a passionless existence full of empty hours, more seconds ticking off the clock of his life. Then one day, while flipping through one meaningless channel to another on his television, a commercial captures his attention. It is an invitation to sponsor a needy child in Africa. And Warren Schmidt responds. The child's name is Ndugu, and his letters of confession to Ndugu become the thread that weaves all the other pieces of this film into a whole. "My trip to Denver is so insignificant compared to the journeys others have taken... I know we're all pretty small in the big scheme of things, and I suppose the most you can hope for is to make some kind of difference. But what kind of difference have I made? What in the world is better because of me? When I was out in Denver, I tried to do the right thing, tried to convince Jeannie she was making a big mistake, but I failed. Now she's married to that nincompoop and there's nothing I can do about it. I am weak, and I am a failure. There's just no getting around it. Relatively soon I will die... Once I am dead and everyone who knew me dies too, it will be as though I never even existed. What difference has my life made to anyone? None that I can think of. Hope things are fine with you. This one I rank high on my "short list" of recommended films. If you've not seen it, check it out. As we enter the last weekend of January I'll be removing my art from three venues. The Dylan Daze display will come down this morning at the Superior Library. Tomorrow, late afternoon, I will be removing my work from the wall at Starbucks in Duluth. On Monday, the brief but exciting display at The Thirsty Pagan will be dismantled. No laments. It was gratifying getting feedback from patrons of the Pagan this week. One metal sculptor ran out to his car to show a knife and a pendant he'd made. Artists enjoy sharing their work with other artists who might appreciate the craftsmanship. The Thirsty Pagan is a local brewery in Superior with out of this world pizza, calzone and other specialties including live music nearly every night of the week. Because of the music, I included a number of music-themed pieces, including a couple more Dylans, a brush-and-ink guitarist loosely based on Keith Richards, and a few others. My ever popular portrait of Sitting Bull continues to get comments. Based on a famous photograph of the Sioux chief who is credited for General Custer's demise (Custer's vanity was the real culprit) friends and acquaintances interpret the eyes as conveying a lament not only for what Native Americans have lost, but for their future as well. I'm grateful to have been able to capture, even to a small degree, this emotional connection to his heart. Well, all that to say, if you want to check it out, tonight and tomorrow will be your last chance. Good brew, live music, atmosphere... what more can you ask for? Click on images to enlarge. See something you like, send me a note for pricing. It is an awesome thing to be a young artist in the vicinity of New York or San Francisco or other major cultural centers where art flourishes, nourished by the variety of aesthetic experiences exploding there. Truth is, wherever you go across the land, by whatever ribbon of highway you travel, you will discover pockets of creative energy displayed. There are artists everywhere doing some very cool things. Why are we so fascinated with lists? You can't turn around without seeing them. I'm talking here about the kinds of lists that we read in magazines and newspapers or see on television. For example, you're watching a football game and they show the ten greatest plays of the most recent NFL season. They could just show great plays, but no, they give you a countdown. Number 10, number nine, etc. Rolling Stone will have the 100 Greatest Rock Albums of all time... The 100 Greatest Male Vocalists.... the 500 Best Album Covers. Forbes annually does profiles on the 400 richest people in the world. Our fascination with lists never ends, and we keep making more of them. Perhaps it's because we have an innate desire to organize the universe? I mean, if you just had everything out there in piles of information without lists, what would that be like? So we number things and rank them, greatest actors, greatest films, most beautiful out of the way places to visit, most exciting places to go in the world, most helpful websites, shortest NBA professionals, best golfers, greatest battles, top party schools... There's no end to it. And the appeal seems equally endless. Here are two sites that make unusual lists. Some of those in the previous paragraph came from http://www.toptenz.net/, a site that seems to exist solely for the purpose of assembling lists of ten. Today's list of lists begins with Top 10 Mind-Blowing Movies. Maybe that's the fun part, just trying to guess which films or items will end up on their list. We can even argue with them about it. "Why wasn't Psycho on the list?" you want to ask. http://listverse.com/ is another website that lists lists. Listverse differs from TopTenz in that they don't just have lists of ten. The second list here today is Top 15 Greatest Silent Films. Other lists this morning include, 10 Male Supporting Actors w Deserved Oscars, 1o Fascinating Facts About The Gift of Life, 10 Gamblers Who Beat The Casino and 10 Places With Morbid Names. (You always wanted to know, didn't you?" They used to call it the angry red planet. Because of its proximity, fourth planet from the sun and first beyond our own, astronomers have given it a lot of attention over the years. Named after the Roman god of war, its ruddy color is due to the iron oxide content of its surface, much like Sedona in the Southwest, or portions of the Iron Range in Northern Minnesota. Tonight, and for the next few nights, Mars will be very near to the earth, relatively speaking... a mere 60 million miles away. For amateur astronomers, it won't get any better than this for more than five years. Unfortunately, the forecast tonight in my neck of the woods is below zero, not the most thrilling for setting up a telescope and standing outside. (Six below right this sec and feels like -22.) But the sky is clear and Mars will be on display at its brilliant best if you know where to look. The only things brighter from our vantage point are Venus, the Moon and the Sun... and Jupiter most of the time. Did you know that there are currently three spacecraft from earth orbiting Mars? And on the surface of Mars are two active mechanical rovers, along with the litter of other failed landing craft. Many websites have info on this week's event. Wired.com has a good collection of links, too, not only to Mars photos, but to other collections of images by astrophotographers. And for rank beginners this site will help you locate our red buddy with it polar ice caps, craters, valleys and deserts. For more info on our near-Mars experience, start here. For something a little different, a lesson for Earthlings, read Peter Opack's lament, The Empty Skies of Mars. While in L.A. last week I was at dinner with someone in the auto aftermarket who made the comment that "the internal combustion engine will be with us a long time because gasoline is the cheapest form of power." Oil is a plentiful commodity still, and the research has led many to believe the center of the earth is full of it, hence in many places emptied oil wells have refilled afterwards. This person said one reason gasoline is expensive, on the other hand, is because of taxes. I don't know how true that is, but I do know that any transition to electric cars will be exceedingly expensive due to the lack of infrastructure. Most people do not recall that in 1900 there was a battle going on regarding the primary power source for cars. As many as fifty percent of all cars were electric. Did you know that? The problem is that they only went about twenty miles before needing the battery re-charged. And where would you get that re-charge if you tried to go from New York to Boston? The first internal combustion engines did not take the motoring public by storm. Though many inventors produced various designs for this novel approach to mobility, Gottlieb Daimler is often credited with developing the first prototype of the modern gas engine, including a vertical cylinder with gasoline injected through a carburetor. A year later, in 1886, Karl Benz obtained the first patent for a gas fueled car and the horseless carriage was on its way. The first battery powered carriages were introduced as early as the 1840's with a non-rechargeable battery. Improvements in the battery made battery-powered vehicles increasingly practical, and by 1899 there were more electric cars on the road in Britain and France than there were gas powered vehicles. In the late 1890's there was even a New York City taxi fleet composed of electric cars. Electric cars were quieter, cleaner, and offered a much more pleasant motoring experience. And they could run at a pretty decent clip as well. In 1899 a Belgian built electric car called "La Jamais Contente" (image at left) was clocked at 68 miles per hour, setting a world land speed record. This very car was on display at the Detroit Auto Show last week. The gas powered counterpart was a hand-cranked contraption that smelled, vibrated a lot and made a lot of noise. The hardest part of all was changing gears, which you didn't have to do in an electric car. Electric vehicles did have their limitations. First, they were expensive. Second, they had a range of less than 20 miles, which became problematic in a wide open country like the United States. I am guessing that gasoline has another advantage. Because it can be taxed, it just might be the ticket for funding our universal health care program. When you look at the cost of hybrids and re-charging stations, a high gas tax on users of fuel just might make some dollars, and sense. When I wrote The Red Scorpion it was my first novel length story. 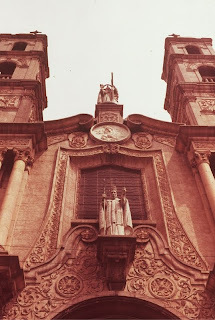 I originally wrote this section of the book, Comstock in Mexico, as a journal. By doing so I learned the limitations of such, and re-wrote the twelve or so chapters as a first person account. First person has some wonderful benefits. But it seemed third person would enable me to get the multiple viewpoints I felt necessary to convey a few key ideas. Every step of the process became a learning experience, a journey. From childhood Chuchui had been accustomed to hard physical work. Walking great distances to the marketplace, following the men and womenfolk and carrying a share of the goods as well, Chuchui had learned responsibility. Chuchui’s father was a very proud man. He took great care to be deliberate in all his actions and always tried to move gracefully. His gestures when speaking were likewise grand and dignified. Chuchui observed all of this, and came to understand that for his father there was no greater achievement than to be a Nahuatl. One day, Chuchui became ill and began to weaken. He tried to conceal his illness, but as the party of Indians padded down the hillside toward the city, the perspiration spread over him and his eyes began to glaze. When he could walk no further he squatted to rest. “What is it?” his sister Lanti asked. Chuchui stared ahead as the small party of merchants continued away from them. “Youre hot!” Lanti said abruptly, having placed her hand on his forehead. “How long have you been -"
Chuchui cut her off. “I will go to the market. It is not my place to be weak.” He stood uneasily, and they continued on toward the city. When they reached the outskirts of Cuernavaca he stooped once more. “You go. I will follow soon,” he said to his sister. Lanti had always been kind to him, but she was simple. He had no brother and there seemed no one with whom he could share his confused and burdensome thoughts. At times he wondered whether it were he or the gods who were blind. Nahuatl life was like the gouge a heel makes in the sand which is so soon washed away by the rain, leaving no mark. Twenty years or eighty, what matters when the mark is gone? The marketplace was teeming behind Cortez’s Palace. Dr. Comstock stood atop a thick wall and watched the orderly chaos. The large triangular area resembled a flea market of sorts, but without the tables. The variety of goods exceeded comprehension -- food, clothing, poultry, medicinal herbs, eyeglasses, jewelry, pottery, trinkets, antiques, pinatas, crafts, toys, leather goods, shoes -- a little bit of everything, useful and otherwise. He looked down at a rooster tied by one leg to a wooden crate. Normally it would have amused him, but today it depressed him. In some way he felt a little like that rooster who at first appeared to be free, but was bound. Comstock watched the peasants set up their little booths and spaces for selling or trading wares. He was attracted to the dignity and cleanliness of the Nahuatl villagers in their distinctively simple white outfits. But his thoughts were elsewhere. On his first trip to Mexico he had visited Taxco, and several of the other places where Quetzlcoatl had supposedly lived and ministered. Comstock had gone to the place where Quetzlcoatl had been baptized. He had even managed to locate a place where Quetzlcoatl had reputedly performed a miracle. But where was he last seen? Where had he died? Comstock could not get away from this question, nor could he find anyone who knew its answer. Comstock turned away from the marketplace, pondered his next move. He walked north and turned left toward the main square. 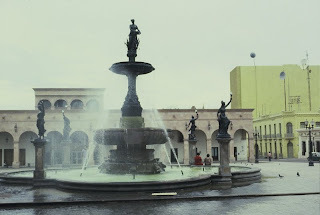 By the time he reached the Zocalo he was feeling very depressed. He didn’t have a plan. He’d thought he could just wing it, and was now fully conscious of his folly. The so-called borracho was dressed in the native whites of the Nahuatl. Comstock looked about, his expression an appeal for help, but the passersby avoided making eye contact. Comstock bent down and rolled the man over to make sure he was breathing. The native looked to be no more than a youth and had badly skinned the bridge of his nose. The native’s face was unpleasant to look at, moist with sweat, made filthy by dirt and grime from the street and the oozing blood from his scraped nose. Comstock looked about once more but no one even seemed to be paying much attention. There were benches nearby where seated tourists were watching a scene in the park. A group of mariachis was gathering. An old man with a trumpet had now joined them. Comstock called to a vendor from the nearby gazebo and asked for a glass of ice water, which the vendor remarkably brought right over. Comstock rubbed the Indian peasant’s nose with an ice chip and shook him gently. His head fell limp to this side and that, until the professor threw the glass of water directly into his face. The youth coughed once, then opened his eyes, sputtering words the American could not understand. “Are you all right?” Comstock said. Chuchui looked at him attentively, but cautiously, without making reply. Comstock helped Chuchui to his feet. “Thank you,” Chuchui said in almost perfect English, whereupon he turned, walked briskly away and disappeared in through the door of a hacienda. Comstock, looking confused, turned round in a complete circle, then sat down. Suddenly, he leaped to his feet and followed the young Nahuatl inside, but Chuchui was nowhere to be found. “Have you seen the native,” Comstock asked one and then another hotel employee, but no one had an inkling what he was talking about. It was apparent Comstock had misjudged him. Chuchui’s “Thank you” earlier in the day had thrown him off. It was something he learned to say when doing business with Americans in the course of his work. Undaunted, Comstock began to address him in Spanish. “Donde vas,” Comstock said, which means "Where are you going?" Chuchui shook his head, tried to speak but no words came. Suddenly his voice broke and he began to cry. This was not something Comstock had expected. Chuchui placed his palm on Comstock’s arm while his eyes scanned the square, darting here and there, as if he were afraid of something. 1. Obama is right. Our health care system is broken. 3. The time to do something about it is now. 4. If Republicans and Democrats can't figure out how to work this out, we need a batch of leaders who can. On my flight back from L.A. Friday the fellow next to me was a Canadian. I asked about health care in Canada. He said everybody has it and it's good. On one of my trips home last year I sat next to someone in the Detroit airport from Norway (or maybe it was Denmark, a Scandinavian anyways) who I also asked about health care where he was from. He said it was thirty dollars. I asked what that meant, and he said whatever you go to the doctors for, the whole visit, tests, everything, was thirty dollars. A fellow I work with has a brother in France. There were things he has not liked there, and the taxes are high, but as he battled cancer a couple years ago he was grateful that his medical expense would result in him losing his house. We have been the richest country in the world, yet we say we cannot afford universal health care? Why are we the only country then that can't afford this when most lesser companies can? A normal, healthy approach to the problem would be to have those who oppose explain why. Reply: "O.K., if we fix ______ can we do it?" Then both sides should address and fix each of the barriers. etc. I do agree with those who say that government run programs are usually inefficient and expensive as compared to the efficiencies normal businesses are required to operate at in order to be competitive. But that's a red herring, isn't it? The net net is we can't claim to be a compassionate nation and just let people suffer because they can't afford health care. As for the bill that is on the table now, from what I hear there are lots of problems with it. It may be because the bill is over 2,000 pages and our representatives haven't figured out how to find time to read it, let alone debate it line by line. Consider this: the Social Security Act of 1935 was 82 pages. The Civil Rights Act weighed in at 74 pages. The National Labor Relations Act a slim 25 pages. And the Homestead Act 9 pages. These were major legislative events. Why is the current Health Care Bill so hefty then? What if Democrat and Republican leaders put their best and brightest in a room and say, "O.K., you can't come out till you have hammered out a health care bill. It must be under 100 pages." Fifty pages would be better. And maybe one more thing. They take off their party hats and pins and put cotton in their ears so they can't hear the shrill voices of lobbyists... and they focus on using all the knowledge and experience they each have to think for themselves, no strings attached. Evidently I am living in a fairy tale at this point. Bummer. I remember in the 1990’s when the Dow Jones Industrial Average was climbing into heady new territory above 10,000, 11,000, and 12,000 there were prognosticators predicting these valuations would rise to the skies. Then the bubble burst. The tech stocks collapsed, and the Dow with them, as the bears had been saying all along. “These new valuations are unsustainable,” they were saying. Turns out the bears were right. But what I remember is the ease with which people could say that tomorrow will be more of what we are experiencing today, and everything in those heady late nineties was up. The next collapse we all experienced was one that no one anticipated, and it hit us like a ton of tricks. The devastation when the Twin Towers of the World Trade Center fell was emotional as well as visible. And though I’d venture that few people in the heartland expected such a thing, there were voices raised that no one took heed of, for whatever reason. Maybe they just sounded grumpy and negative and we prefer good news and happy prospects to warnings. Then there was the housing market, another bubble that was unsustainable. Those who spoke of impending disaster were disregarded. Then the banking industry fell apart. As the decade’s end approached, people who wanted new cars were unable to buy them because credit was no longer easy. Which left the auto industry slammed. The decade included its share of natural disasters, from Hurricane Katrina to the tsunamis that caused so much devastation. And then there were the wars…. Iraq, Afghanistan. As we look forward I listen to all kinds of predictions about what will come next, and frankly, I just don’t think anyone can say anything with certainty. It takes very little imagination to come up with a whole set of fairly bleak scenarios. But it could easily be argued that (and I hear people saying this) the worst is behind us. One thing I can be fairly sure of is that the Minnesota Vikings are not giving a lot of thought to whether or not the end of the world is at hand or that the economy is going to rebound or collapse. As they face off with the New Orleans Saints tomorrow, they have but one thing on their minds… being ready with a solid game plan. As for the rest... what will be will be. And we'll deal with it. The story details the arrest, the beating, the humiliation and the interrogation. As the story brings you to its epiphany, you discover he has just been released from a five year prison term. His crime: a happy face. Unfortunately, new laws had been passed while he was incarcerated and this time he was arrested for his unhappy face. This seemingly absurd story about arbitrary law is apparently becoming more than just a thought provoking piece of fiction. According to an article in Popular Science titled "Smile Police" (Feb. 2010, p. 56) a new smile scan software has been introduced in Japan. The computer reads facial movements and rates your happiness on a scale of 1 to 100. The new technology is currently in use in more than 100 Japanese businesses and organizations. Don't worry. Be happy. Or else. *My Melancholy Face, Heinrich Boll, translated by Rainer Schulte and Sandra Smith, 1967. When our kids were growing up we home schooled for a several years. Susie did the yeoman's work. I created quizzes and taught writing, which led to my writing a short book (as yet unpublished) about how to teach writing. One piece of the advice I'd share is that if you can figure out ways get them to write, then you will have something to edit. If they enjoyed the exercises they were more likely to produce copy (words on paper) that you could then utilize to praise while also correcting. One assignment I gave was for each of them to describe a room in our house, but from the point of view of being one inch tall. The whimsical Shel Silvertsein poem below might have been his solution to such an assignment. Do a Google search for What's New and you come up with a somewhat surprising list of links, to new blogs, new tasks that keep the Gmail team busy, new things on Snopes, updates on the H1N1 flu, and all manner of other things. •fresh: original and of a kind not seen before; "the computer produced a completely novel proof of a well-known theorem"
•raw: lacking training or experience; "the new men were eager to fight"; "raw recruits"
•having no previous example or precedent or parallel; "a time of unexampled prosperity"
•new(a): other than the former one(s); different; "they now have a new leaders"; "my new car is four years old but has only 15,000 miles on it"; "ready to take a new direction"
•unaffected by use or exposure; "it looks like new"
•newfangled: (of a new kind or fashion) gratuitously new; "newfangled ideas"; "she buys all these new-fangled machines and never uses them"
•in use after medieval times; "New Eqyptian was the language of the 18th to 21st dynasties"
•Modern: used of a living language; being the current stage in its development; "Modern English"; "New Hebrew is Israeli Hebrew"
•(of crops) harvested at an early stage of development; before complete maturity; "new potatoes"; "young corn"
•newly: very recently; "they are newly married"; "newly raised objections"; "a newly arranged hairdo"; "grass new washed by the rain"; "a freshly cleaned floor"; "we are fresh out of tomatoes"
New is often considered something special and attention getting. This is why many companies love to tout "New" in their ads when able, because it seems to be a hot button for consumers. Many major trade shows have a section for new products. And magazines, too, often have a "What's New" section because readers want to know. In fact, it sometimes seems like the only thing better than what's new is "What's Next" which magazines like Wired and Popular Science use to great effect. Last fall in-flight mag I was reading had an article on the Top Ten New Restaurants of 2009. I'd like to add one more to the list: Jeffrey's Hillside Cafe. One of Santa Rosa's most popular chefs the past two decades, Madura opened his own new dining spot this past summer adjacent to The Hillside Inn on 4th Street straight east from downtown. The menu is to die for, as they say. Jeffrey's Hillside Cafe is a breakfast and lunch event, and when we were there just before Christmas it was packed. On Christmas eve day there were perhaps 18 people out front at one point. I've always believed an empty restaurant is a bad sign and one where people are willing to wait is a good one. The cafe has an intimate feel and all the windows face south to capture that sunshine which makes any experience a better one, especially dining with friends. I insist that you follow this link and check out the breakfast and lunch menus. Then allow your mouth to water a bit as you think about how to afford a trip to California so you can eat a meal in Paradise. The image at top right in of the trees outside Jeffrey's, and below is a view through to the kitchen, Chef Jeffrey in the window, with the sign above that let's you know you're always welcome here. He was eighteen years old. Though his chest had yet to fill out Chuchui had reached his full stature, little more than 5 feet 6 inches like the other men of his tribe. He had light brown skin and the typical Aztec face with a prominent, hooked nose and dark brown almond-shaped eyes. His coarse, black hair had been cut with a fringe over the forehead. He allowed his hair to grow a bit longer in the back and on market days he tied it in a small pigtail with a piece of red twine. Long before the crimson sun had burned the haze off the moist hills encircling his home, he had begun the trek to the marketplace in Cuernavaca, to sell the strips of beef jerky, leather goods and black pottery that were the commerce of his village. Though but a boy, he had seen much and thought much about what his life was about. He was not like his peers. An experience at age twelve had awakened in him a keen desire to embrace more of life than was offered in this remote village. The following summer, despite his father’s disapproval, he taught himself to read Spanish, even though it was not his native tongue. Chuchui took care to hide his books, but continued to read and to study the ideas outside his village. When he was sixteen two men came to his village who called themselves communistas. They brought pieces of paper with words on them. No one could read the words on the paper except Chuchui and he read aloud the statements on these papers to the village elders. His father and the village leaders cursed the outsiders, but Chuchui wondered at their ideas. “A fool does not see the same tree that a wise man sees,” his father told him. For years his mother grieved because she sensed that one day he would leave their village. The day Chuchui read these pamphlets from the communistas she knew that she had already lost her son. If you can't be there in person, TV is probably the preferred method of watching a football game. But a lot of people settle for radio when they are in their cars or working in the garage. With the advent of Internet you have additional options. ESPN offer a great NFL Gamecast with play by play, game stats and ongoing boxscore. On a typical Sunday you can pop in and out of all the games being played at the moment. Admittedly, one thing you don't get with NFL Gamecast is crowd noise, or commentary on those special moments when the fans stand up to cheer their home team. Nevertheless it's another way follow the unfolding story. Then there's Twitter. Whereas NFL Gamecast gives the facts, staight up, without commentary, Twitter can sometimes become a wild brawl with colorful language and intense emotions. Here's a brief exchange that took place after Brett Favre took a hard hit by assaulting Cowboys. hodag91: @DarnBurr was that something nice that you just said about favre? shella10: Though I don't like the soap opera drama he brings every offseason, I still respect his work ethic. 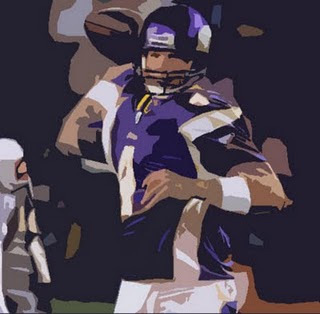 Go Favre! 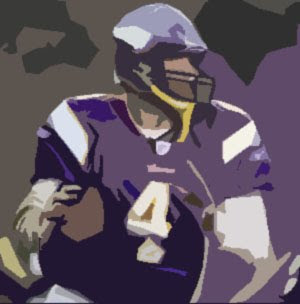 macrwc: Not really a Brett Favre fan, but like the Cowboys even less. Go, Vikings! stacerz02: uh oh - the cowboys better get going ; minnesota is up 17-3 with 12:17 left in the 3Q - Romo- don't let Favre dominate you like that! The tragedy and trauma that is going on in Haiti right now is on a scale few of us in our comfortable homes can imagine. David Brooks, in an excellent NY Times editorial Friday, points out that the enormity of the devastation reveals much about the developed world's ineffective efforts to meet the real needs of impoverished peoples around the globe during the past century. Brooks' essay, The Underlying Tragedy, begins by comparing and contrasting the results of this earthquake to the 7.0 shaker that struck San Francisco during the 1989 World Series. Less than 100 were killed there and in this one they estimate fifty thousand, and counting. The difference in outcomes between these near identical quakes reveals some difficult truths about the disparity between various parts of the world. "The first of those truths is that we don’t know how to use aid to reduce poverty. Over the past few decades, the world has spent trillions of dollars to generate growth in the developing world. The countries that have not received much aid, like China, have seen tremendous growth and tremendous poverty reductions. The countries that have received aid, like Haiti, have not. In the recent anthology “What Works in Development?,” a group of economists try to sort out what we’ve learned. The picture is grim. There are no policy levers that consistently correlate to increased growth. There is nearly zero correlation between how a developing economy does one decade and how it does the next. There is no consistently proven way to reduce corruption. Even improving governing institutions doesn’t seem to produce the expected results." Here's a second hard truth, according to Brooks... "micro-aid is vital but insufficient. Given the failures of macrodevelopment, aid organizations often focus on microprojects. More than 10,000 organizations perform missions of this sort in Haiti. By some estimates, Haiti has more non-governmental organizations per capita than any other place on earth. They are doing the Lord’s work, especially these days, but even a blizzard of these efforts does not seem to add up to comprehensive change." American doctors, mission organizations and food organizations have been sending help to Haiti for decades. In my Wednesday commentary, I cited a young Iraqi war veteran who devoted some time at a Catholic mission there. Brooks, however, raises a good point. The compassionate sacrifices of ten thousand organizations has not changed Haiti's future from hopeless to hopeful. Why is this? His third hard truth brings additional light. "As Lawrence E. Harrison explained in his book 'The Central Liberal Truth,' Haiti, like most of the world’s poorest nations, suffers from a complex web of progress-resistant cultural influences. There is the influence of the voodoo religion, which spreads the message that life is capricious and planning futile. There are high levels of social mistrust. Responsibility is often not internalized. Child-rearing practices often involve neglect in the early years and harsh retribution when kids hit 9 or 10. "We’re all supposed to politely respect each other’s cultures. But some cultures are more progress-resistant than others, and a horrible tragedy was just exacerbated by one of them." Much more can be said on this point alone, but I'll save that for another space in time. You can read the rest of Brooks' commentary here. The other day, when I wrote about A Unified Theory of Everything, I mentioned that I've been listening to The Compleat Idiot's Guide to String Theory. If nothing else, books like this are a good reminder of how little we know about the universe we inhabit. It's humbling. But the mental stimulation is fun, too. For example, what if at it's basic essence the universe is digital and everything is simply binary code? And what if this code was being stored on a hard drive somewhere, and backup copies of the code were being stored on backup drives? And what if we were living in a universe that had been stored on a backup with a corrupted drive, which explains why so many things are so messed up? This could also explain the feeling that there are parallel universes. No, that wasn't in the book. But there are a lot of things here that are hard to get your head around. Like Black Holes. Or the idea that the universe is expanding and actually has an outer edge. This concept is just too much. According to estimates of how much mass would actually be needed to keep the average galaxy from flying apart, it is now widely believed by physicists and astronomers that most of the matter in the Universe is invisible. This matter is called dark matter, and it's important for cosmology. If there is dark matter, then what could it be made of? If it were made of quarks like ordinary matter, then in the early Universe, more helium and deuterium would have been produced than could exist in the Universe today. It amazes me how scientists can talk so authoritatively about such esoteric knowledge. One section of the book was throwing around numbers about the size of the universe and this itself escapes comprehension. If light travels 186,000 miles per second, think how far does it go in a year? Now imagine 47 billion light years. Sounds pretty far out, doesn't it? If you travelled half way to the end of everything, you might start feeling pretty lonely out there. The Milky Way alone is but one whirling galaxy of 100 billion or more stars and there are more galaxies out beyond this than we can count. Current estimates hover around 10 Catiline, or 10 trillion billion, give or take a few. And all of it is in motion, even though those stars we can seem pretty fixed from where we sit, moving so fast away from one another that even this is incomprehensible. Mix in questions about quantum gravity, 6-dimensional Calabi-Yau space, brane collisions, Ekpyrotic Theory and the Big Splat, spacetime, event horizons and supersymmetry and what is going on here? At the end of the day there are more important questions, the kind that make pop music a great source of comfort, questions like, "Will you still love me tomorrow?" and "How can I be sure?" For a relatively small city Duluth has a fairly active arts community. There are, however, a finite number of spaces where one can show one's work, and once you start poking around you will quickly see who's actively seeking venues to display. Ever since my show at The Venue last summer I have been returning each month to see who else is making pictures. 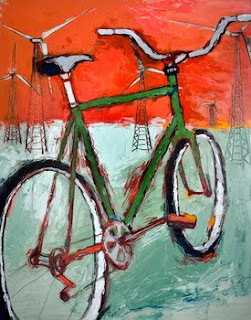 It was there that Adam Swanson's bicycle paintings first caught my attention. Like some of my own work, he paints on masonite. And it is clear that he loves the whole process of painting in the same way that Diebenkorn or Picasso is "painterly." I then saw a few of his pieces at Lizzards, and currently his work is decorating The Red Mug, another high profile space in a very artsy setting in Superior, across the bridge. This week I contacted Adam to see if he had time for a short interview whereupon I learned of his circuitous route to Duluth. And like most of the artists I have, their lives are as interesting as their work. Ennyman: You mention that you are new to Duluth this past year. Tell me about your life before coming to Duluth? Adam: My life these past 10 years has been fragmented into a variety of short, semi-related sections. Before coming to Duluth last February, I spent a year abroad. After living for 3 years in Ithaca, NY working as a book and manuscript conservator (and painting) I moved to Antarctica for a 9 month contract position fixing and working on boats used for science. The contract left me in South America where I spent a few months traveling. I eventually landed in MN last January, looking to set up shop somewhere to work on my art. I began at a cabin on the north shore of Lake Superior and finally found a spot in Duluth to work on art full-time in February. That lasted (and it was good) until August, when I started working at my current job. Ennyman: What do you do for a living to support making paintings? Adam: I am a bartender at Zeitgeist Arts Cafe. Ennyman: What is your opinion of the current art scene in New York? Adam: I don't know much about it. I like conceptual art quite a lot. In fact, concept is one of the main things that holds me in a work of art. Seeing art in New York usually excites me because with so many people, there are so many ideas floating around. I have been to New York City about a dozen times and always find something that makes me think about things in a new way. There is so much art to see in the whole world however; it is important for me to be engaged and I love it when I can key into a few personally meaningful ideas. Ennyman: When did you first become aware that you had a desire to paint? Adam: I have been making art since I was a child and began to take it more seriously during my undergraduate degree in studio art at UMD. I paint now because it's the best way I can think of to make imagery that grabs people and expresses some of my ideas. I like to paint because it is a meditation that I have on an idea. Painting is something I am working on getting better at, so that I can communicate more clearly. But I really love all art forms and would love to get into something else someday. Sculpture or film perhaps. Ennyman: Who were your biggest influences as you pursued a life as an artist? Adam: Vincent VanGogh, Andrew Goldsworthy, Talouse Lautrec, Robert & Shana ParkeHarrison (Architect's Brother), Edward Gorey and of course there are many, many more. 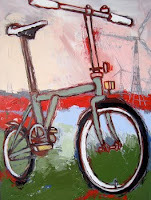 Ennyman: What's the story behind all these bicycle paintings? Adam: Firstly, I love bicycles. Bikes are a symbol of human ingenuity to me. I believe they have character and are very lovely, efficient machines. If I could paint people better, I would probably paint them in their place much of the time. When I make my work I am primarily focusing on our natural universe and the human place within it. Bikes are also a great way for me to experiment with my technique. They are complicated objects with lots of little bits and pieces and it has been fun to (try and) pare it down to minimum components. Most of the bikes I paint are of friends or loved ones. Many are of the 1969 Schwinn Cruiser my dad gave me. I have put a lot of work into it and I love the way it looks. Ennyman: Why the decision to paint on masonite panels rather than canvas? Adam: I like the texture of masonite. The texture of canvas has always been something I struggled to get rid of. And I never roll it up, so having a painting on a board is roughly the same weight and shape as having it on stretched canvas. Masonite is cheap and sturdy, and often made of recycled materials. I have thought about painting on birch or some type of wood, to lower the acidity (though I am not sure it would). But masonite always seems to be so much flatter and straighter. And I gesso it up pretty good before painting. I think my paintings are fairly archival...? I take photos of all of my paintings, because the end image is really important to me. I would like to have better photos. Ennyman: What's your current situation with art/work/life? Adam: I live in Duluth in Central Hillside. I live with my girlfriend and we are getting ready for a baby. I have a studio in my house, where I work at least a few hours a day. More on my days off. And looking forward to having a couple of months again before my next show to do some more experimenting. Note: To catch Adam Swanson's paintings in person, be sure to visit the Red Mug in Superior during the month of January. If that doesn't work for you, because you live in Portugal or maybe Brazil, visit www.adamswanson.com and see why many people are finding his work exciting. And, for the record, his themes include more than just bicycles. Check it out. While checking in on Twitter to see what the response to Haiti was, I did not see Haiti listed at that moment. American Idol was there. No surprise. I think American Idol would be a top trending topic even if World War III were unfolding and missiles falling. What surprised me was to see Pat Robertson as a top topic. This was strange, until I saw what the buzz, or rather outrage, was about. It’s too bad he didn’t just cite, “The rain falls on the just and the unjust” and ask for help for these anguished peoples. Rather, he said in effect, they had it coming. The wonderful service of Christians to the hurting and needy is well documented throughout history, from the Franciscans to the Underground Railroad to the Red Cross and the countless efforts of unheralded local churches. Sadly, history has records of other less noble responses to need. The Irish Potato Famine, but one example, resulted in the death of millions because Christian leaders in the British Parliament argued that the famine was an act of God and that it would go against God’s will for Britain to extend mercy by providing food to the starving. These are, sadly, historical facts and indeed damage the reputation of the church. With embarrassment and pain I recall to mind how when the twin towers of the World Trade Center collapsed in 2001, more than one Christian rejoiced because it was a sign of the end times. I share this with a heavy heart because it is in such contrast to a central feature of Jesus' ministry, whose compassion for those who were suffering caused Him great anguish. When Jesus saw suffering, He had compassion. Matthew 9:35,36; Matthew 14:13,14, 34-36. In late 2007 I wrote about a young Iraqi War vet who, after returning from service, went into one of the very neediest ghettos of Port-Au-Prince to help a Catholic outreach there. To get a handle on how needy this nation was even before this week's quake, you may wish to read my blog entries titled A Baby Ripped His Heart Out and A Trip to the Morgue. Let's be sober minded today and remember those who have been less fortunate than ourselves. I don't know if you have been paying much attention to what's been happening in the sciences since we went to school (am talking to old codgers like me for the moment) but a lot has changed since our high school chemistry class in the Sixties. I'm referring generally to the attempts by physicists and scientists to explain how everything in the universe is connected, and the research being done to prove these theories about what holds the universe together, why it is what it is, etc. What got me stimulated here is the book I started reading yesterday, The Complete Idiot's Guide to String Theory. The book's description begins with the statement "Everything is connected." We’re living in the midst of a scientific revolution that’s captured the general public’s attention and imagination. The aim of this new revolution is to develop a “theory of everything”—a set of laws of physics that will explain all that can be explained, ranging from the tiniest subatomic particle to the universe as a whole. Here, readers will learn the ideas behind the theories, and their effects upon our world, our civilization, and ourselves. One way to look at the problem goes like this. What are objects made of? Molecules. And what are molecules made of? Atoms. Now that is as far as we got in chemistry class when I was in school, trying to understand the behavior of electrons, protons, and neutrons. But many of us did have a nagging question. What are electrons, protons and neutrons made of? Science is getting into the theoretical here, but their answer is quarks. Then the question is, what are quarks made of? At this point, string theory enters the picture. According to Wikipedia, "String theory is a developing branch of quantum mechanics and general relativity with the aim of merging and reconciling the two areas of physics into a quantum theory of gravity. The strings of string theory are one-dimensional oscillating lines, but they are no longer considered fundamental to the theory, which can be formulated in terms of points or surfaces too." "In a similar manner, in string theory, the elementary particles we observe in particle accelerators could be thought of as the 'musical notes' or excitation modes of elementary strings. "In string theory, as in guitar playing, the string must be stretched under tension in order to become excited. However, the strings in string theory are floating in spacetime, they aren't tied down to a guitar. Nonetheless, they have tension. The string tension in string theory is denoted by the quantity 1/(2 p a'), where a' is pronounced "alpha prime"and is equal to the square of the string length scale. The reason scientists are so excited about all this is that they have a conviction that a properly conceived understanding of string theory will help explain the way the universe works, including black holes, quantum mechanics, space and time. The need for a suitable unifying theory is that current theories have contradictory aspects which do not satisfy all the questions they raise. A lot of it has to do with relationships. For example, on first blush there does not appear to be any relationship between the full moon rising on the horizon and an apple falling from a tree. But we know now, thanks to Newton, that the theory of gravity has a bearing upon the behavior of both. 35 years ago or more I used to ponder the relationship between these four things... a tree, the sun, a butterfly and laughter. Think about that for any length of time and it really blows your mind. How different these things are. Two are different forms of life. Both of these are dependent on the sun. Think of the size differentials and how different the various substances. Then add laughter. Laughter is totally different, yet it is something that exists. Where did laughter come from? I think it is interesting that in the Old Testament story of Abraham, God told Abraham to name his son Isaac, which meant laughter. The child was product of a miracle since Sarah was beyond child bearing years by decades. The name reveals something about the character of God, who created this universe of suns and butterflies and trees. My own first foray in developing a unified theory of everything concluded then with the conviction that the common denominator in everything was God, who created it all. As for string theory, it looks like The Complete Idiot's Guide is going to be a good read. It's like I'm playing "catch up" on four decades of research since my high school daze. What an amazing universe... and time to be part of it! Don't confuse Dylan Daze with Dylan Days. Dylan Days is an event in Hibbing that "happens every spring", not unlike the migration of birds north or the start of a new baseball season. Dylan Daze is the title of my small collection of Dylan paintings, drawings and memorabilia, now on display in a showcase at the Superior Library. Library director Nora Fie gave me a call last summer after seeing my show at The Venue @Mohaupt. She said the library had begun using its display space for showcasing local artists and would I consider it? I said yes, of course. She gave me the dimensions and I considered that a part of the challenge. At The Venue I had hundreds of feet of wall space. My display area here measured in inches. No problem. Like solving a good word puzzle, it's just a matter of focus. Due to the space limitations this is an incomplete collection of my Dylan paintings and drawings. I was actually surprised at how many pieces I had created over the years. It certainly wasn't intentional... until now, perhaps. I still have a half dozen others that either didn't make the cut or will be displayed at The Thirsty Pagan this coming weekend. Additional features of the Dylan Daze exhibit: the walls of the showcase have been lined with pages from the 1938 London Times. It seemed like a good tie-in to The Times They Are A-Changin', the cover image one of the paintings is based on. 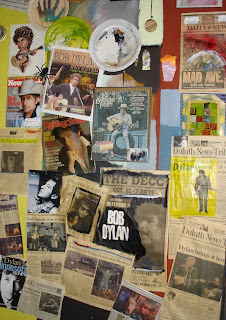 Another feature is that my "Dylan Wall" of clippings and memorabilia (above right) has been dismantled. For years I had been stapling newspaper clippings and magazine covers featuring Dylan to a section on the wall of my garage, which doubles as an art studio from spring to fall. The interplay between these clippings and the pieces themselves makes a fun pursuit as your mind weaves new connections between the art and the events. If you're in the neighborhood, I do hope you'll check it out. The library is open daily till 8:30 and on Saturdays from ten to two. It is my hope that this is enough to make you wish to see more. Any painting may be purchased, though the newspaper clippings and magazine covers are from my personal collection of memorabilia and not for sale. At this time, two pieces here are available as limited edition giclee reproductions. Dylan II, the large framed piece on the left based on Dylan’s Times They Are A-Changing album cover is an acrylic wash on paper with an ask price of $1950. Signed, unframed giclee prints are $200. The large central 2’ x 3’ panel is based on another iconic Sixties Dylan image and is also available in a limited edition giclee 16” x 24” reproduction. The first ten will be sold for $300 apiece with the remaining 90 in this limited edition set being $400. At this time I also have a dozen paintings on display at Starbucks in Downtown Duluth if you are over on that side of the bridge. Yesterday, while organizing in my office I came across a journal entry from January 1995 making reference to this story. "Began Red Scorpion yesterday... this feels like the beginning that will last." I ended up writing this section of the books in three different styles, as a diary, as a first person account and as a third person account. Today, it is what it is. Comstock sat at an outdoor cafe adjacent to the main plaza, El Zocalo, sipping a large concoction of jugo de tamarindo, a sweet thick juice squeezed from the brown, beanlike fruit of the tamarind tree. His third day in Mexico, he had become increasingly aware of the passage of time. His first two days were spent in leisurely excursions about the city, consumed with a curiosity similar to a boy turning over fallen logs in the woods seeking salamanders and snakes. Now he was becoming anxious about how to achieve his objective. The days would pass quickly. He berated himself for having already wasted two. A small band of peasant musicians playing an assortment of primitive flutes, whistles and drums had gathered in the street in front of the cafe. A group of children began marching around in circles making whimsical movements, whimpering and bouncing like puppies overeager to see their masters. Another group of boys was working the tables selling Chiclets to the tourists. Comstock recalled how the incessant begging had disturbed him during his first trip south of the border. By the time he left he had grown weary of the burros, mongrel dogs, roosters, strange smells, gritty eyeballs and clashing colors that seemed to throw themselves at him from every side. He was tempted to think that first trip had been a mistake and a preposterous waste of time. Afterwards, however, Comstock missed Mexico immensely. He knew intuitively that one day he would return. He only needed an excuse. He found it in the legend of Quetzlcoatl, the plumed serpent. According to native mythology Quetzlcoatl, also known as Yoalli ehecatl, was the third son of the Lord of Fire and Time. He was given to bring hope and light to the Nahuatl, a tribal people in this region, in the same way his three brothers were given to three other peoples. When he betrayed his father, he was to be banished forever. Comstock’s intent on this journey had been to find contacts who would be useful guides to the actual places where Quetzlcoatl was born, grew up, lived and died, even though most legends say that the god/man simply “went away” and never died at all. Mom has never been shy. She's also always enjoyed contests. Put these together and you have a YouTube video featuring mom, her entry into a contest about saving electricity called Change a Little, Save a Lot. Rather than being submitted to the power company (PPL is the sponsor of this contest) entries are posted online, which is actually pretty clever. The energy tips get shared with a wider audience, and the contest manager has less muss and fuss to deal with in regards to special handling of video entries. I can envision compatibility issues with in-house equipment. By uploading the three minute submissions to YouTube, compatibility becomes the problem of the contestant. The contest is designed to help raise consciousness about the many small ways we can all contribute to reducing our carbon footprint. Whether that means much to you, there are some additional benefits of energy efficiency, including lower power bills. A few extra dollars in our pockets each month is pretty valuable. In this sense, everybody's a winner, though only one person will win the $5,000 Sears Gift Card. Not everyone can enter though. You have to be a residential customer of PPL Electric in Pennsylvania. BUT, everyone can benefit from efforts made to change our energy habits a little. Click here for additional contest details. According to The Hollywood Reporter, Meryl Streep was miffed that she failed to get the role of playing Brabara "Grandma" Newman in this big budget thriller. As noted the other day I have been reading Ben Franklin's autobiography, which continues to be quite fascinating. Yesterday he went into great detail about the influence and character of itinerant Anglican preacher George Whitefield (pronounced hwit-feeld), who played a major role in what is referred to as "the Great Awakening" in the years preceding out Revolutionary War. I believe the Princeton University Library, in its archives, still maintains some of the tracts Mr. Franklin printed for Mr. Whitefield, along with other artifacts of Puritan and Colonial times. It was by means of being Whitefield's printer that Franklin's respect for the man grew, for even though they disagreed on certain matters they had mutual respect. I cite the following passage from his autobiography. "Some of Mr. Whitefield's enemies affected to suppose that he would apply these collections to his own private emolument; but I who was intimately acquainted with him (being employed in printing his Sermons and Journals, etc. 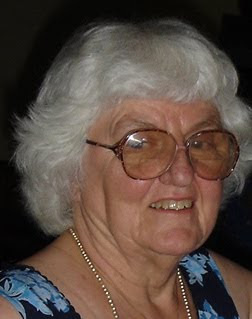 ), never had the least suspicion of his integrity, but am to this day decidedly of opinion that he was in all his conduct a perfectly honest man, and methinks my testimony in his favour ought to have the more weight, as we had no religious connection. He us'd, indeed, sometimes to pray for my conversion, but never had the satisfaction of believing that his prayers were heard. Ours was a mere civil friendship, sincere on both sides, and lasted to his death." Whitefield was an evangelist, famed for his oratory skills. On one occasion Whitefield was preaching and it came time to take an offering. Franklin says he has regular coins, silver coins and gold coins in his pocket. He resolved in advance not to give anything when the offering plates were passed, yet Whitefield was quite persuasive about the good their giving would do, and the first coins were lifted from Franklin's pocket followed by the silver and finally the gold. Another man near him deliberately left his money at home, and began asking to borrow money from his neighbor. Such was Whitefield's power of persuasion. To lift money from peoples' pockets was not, however, his aim. And Franklin begins this section with his positive influence in the communities where he travelled. "It was wonderful to see the change soon made in the manners of our inhabitants. From being thoughtless or indifferent about religion, it seem'd as if all the world were growing religious, so that one could not walk thro' the town in an evening without hearing psalms sung in different families of every street." Whitefield had such lungs of leather that it was purported he could address a crowd of 30,000 and still be heard. Franklin doubt this, until he heard Whitefield speak. Old Ben kept moving further and further from the epicenter of the crowd, continually estimating his distance and the density of the crowd. In the end he was not only persuaded to change his opinion on the matter, but it also caused him to reconsider and accept the veracity of certain historical passages he had previously doubted where generals spoke to their assembled troops before battle. Whitefield crossed the Atlantic thirteen times in his career as an itinerant preacher, also travelling to many other nations, including Scotland many times, Ireland, Bermuda, Gibraltar and The Netherlands. If you have a couple minutes, be sure to read this fascinating account of George Whitefield as seen through the eyes of Benjamin Franklin. That's the tag line in District 9. "You are not welcome here." I rented District 9 from Blockbuster after noticing that it was #1 over where customers' favorites are shelved. I vaguely recalled the trailer at the theater, and seemed to notice that it had gotten a lot of tweets on Twitter. I also noticed that this was a Peter Jackson project and his Lord of the Rings trilogy was indeed an amazing achievement. What really got me, however, was when the salesclerk said the story is told as a documentary. This intrigued me. As if this were something that our news crews were covering somewhere in the world, a real event. She added, "I didn't expect to cry when I saw it in the theater." That's quite an admission. Does a movie like Alien make people cry. No. Just makes you jump out of your seat a few times. So I put on the film while doing taxes last night. Can I just say it blew me away? I found District 9 to be utterly compelling. Here's a typical imdb reviewer's rave... "I will not go far into detail because I would prefer to not spoil anything. This is unlike any sci-fi we have seen in years. Forget Terminator 3 and 4, forget the AVP movies, forget all those laughable sci-fi movies, this film is what we have been waiting for. An original idea, an original concept, brilliantly executed, great CGI, good acting, it just has it all. We have seen many aliens come to earth movies, but this is different, I will not say why though. That is for you to find out when you see it, which I HIGHLY recommend you do." And I agree. The original concept, brilliantly executed, with a story that offers more than meets the eye, is refreshing. My internal interaction with other questions it probes, such as race relations and social problems in Africa, also left me wondering how many layers were embedded here deliberately. Maybe like a great poem or piece of artwork, the reader or viewer takes away more than was there and adds to its depth. The story of how the film came to be, and its origins outside the Hollywood starpulse factory, is also noteworthy. A Nikki Finke column in early November told how the 30 million dollar film came to gross more than 200 million by that point already. "The secret of the indie's success, like Paranormal Activity, was that it was made outside the studio system and marketed outside the studio formula. The edgy and original content, the South African cast instead of Will or Adam or Brad, were thought to be integral aspects which the majors would have rejected during their own development process. "Audiences are driving the agenda and deciding for themselves what they want to see through Twitter and social networking sites," one insider explained to me. When District 9 was screened at Comicon, American Idol's Jordan Sparks alerted 220,000 followers how good the pic was. That's when the pic exploded in popularity. By the time it opened on a Friday, it was the #1 most tweeted topic." So it was a marketing achievement as well as an achievement in film. But let's be frank, unless the product was good, the PR game would not have carried it. And this product is very good. 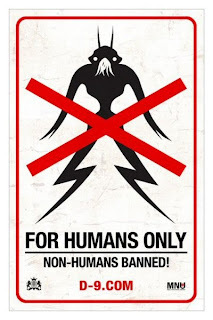 District 9. This one is worth seeing.